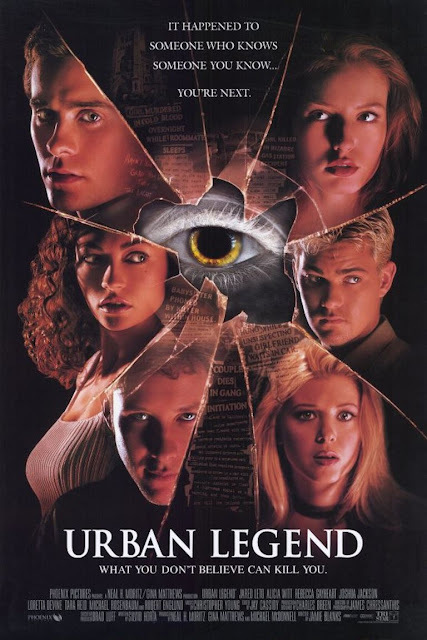 Urban Legends was one of my most anticipated horror releases in 1998. I had a fascination with urban legends since I was a small child when my mother shared with me local stories that involved The Vanishing Hitchhiker and The Devil’s Tramping Ground. Back in 1998, the internet was still pretty small and it wasn’t like you could easily debunk everything with a simple Google search. Urban legends were still making their rounds at school and seeing someone embracing these stories and turning into a narrative excited me. I finally caught the movie when it was released on VHS and instantly fell in love with it. I revisit it every three or four years and haven’t tired of it yet. A New Hampshire college campus begins experiencing a string of bizarre deaths that occur in the form of various urban legends. -The opening scene is amazing. It obviously took its cue from Scream by creating a self-contained short story to open the film, but they utilized one of the classic urban legends and executed it masterfully. It also featured Brad Dourif and he is amazing in everything he does. -Rebecca Gayheart was one of my childhood crushes and so I’d pretty much watch anything she starred in back in the late 90’s/early 2000’s. Alicia Witt was another late 90’s stunner, and let’s not forget this film also featured Tara Reid pre-American Pie and even Halloween’s own Danielle Harris. -On the male side we had Jared Leto, Michael Rosenbaum (pre-Lex Luthor), Joshua Jackson, and Robert Englund. It was a very talented cast of people who I enjoyed in both this movie and others. -The intermingling of urban legends coming to life was just fantastic. I’ve already talked about my appreciation for the art form and I was riveted to see it all play out on the big screen. -I really liked the use of the killer’s costume. It was bulky and out of place, but left a lasting image. -I always felt the ending was a little weak. The chase at the end along with the big reveal wasn’t all that surprising and there were too many conveniences that played out. Slashers are guilty of this a lot of times, but Urban Legends seemed to go just a little too far. -The final scene was fun, but a little absurd considering. You definitely have to check your mind at the door. -The film goes a little meta at times, but it’s nothing too distracting or over the top. All of the post Scream slashers tended to do this. In fact, many of the jokes would probably go over younger viewers heads. -Urban Legends was followed up with two sequels: Final Cut and Bloody Mary. -Brad Dourif who played the gas station attendant is the voice of Chucky and Robert Englund who played Professor Wexler was Freddy Kruger. This film is a solid 8.5 out of 10 for me. It’s a must buy for fans of slashers and 90’s horror. The late 90’s saw a resurgence of teen films. Films such as Cruel Intentions, She’s All That, Can’t Hardly Wait, and Ten Things I Hate About You burst onto the scene in a wave of teen cinema not seen since the 1980’s when John Hughes was king. Like the horror films of the 90’s, the teen movies of the 90’s were not well received and were/are commonly ridiculed for their absurd plots and cliche high school personas. Personally, I love the 90’s teen movies. They remind me of high school and I can relate to the fads, clothing, and music quite a bit. Before I start diving into individual films, I thought it’d be smart to start organizing the horror films of the 90’s into some categories. The horror films that came along in the late 90’s were often horror counterparts to the teen movie fad going on over in the comedy world. In the 90’s, Scream was by far the biggest influencer of horror pop culture and even the films that got made because it showed movie executives that teenagers and young adults wanted more movies about them written in a smarter meta fashion. And so Scream inspired a slew of slasher clones and other genre pieces that were written/influenced by Kevin Williamson (writer of Scream). I’ve created the following list of movies that I feel fall into the late 90’s teen horror film subgenre. It’s by no means complete and to be honest, I don’t have a strict definition of what a teen horror film is. I tried to find films based around high school/college students that conveyed that general atmosphere that teen films do and went from there. This list also includes some films I discovered while researching that I had not heard of. I’m sure some of them are atrocious, but it gives me something to look forward to trying to track down and watch. My introduction into horror movies came via Halloween back in the mid 1990’s with my introduction to Halloween as recapped here. A fascination with the macabre grew out of that first viewing and so did my love for horror films. I spent the 90’s surfing horror movie newsgroups, HorrorSpeak, and the AOL Horror Chatroom, where I absorbed all sorts of horror movie knowledge. Back then, was not too unlike now in the horror community, where all of the 70’s and 80’s horror being held in the highest regard alongside Italian horror. The only real difference is that people are more accepting of some of the horror released in the 90’s, whereas back then even Scream was viewed as a disgrace to the genre. Getting into horror can be difficult. A lot of the best horror isn’t something you’ll find on your local shelf at Best Buy or even on Netflix. That was what made video stores so great. Each trip to a different video store meant you were exploring uncharted territory where a new surprising film may pop up on your radar. These smaller releases were not something every Blockbuster carried, so it wasn’t like everyone in town had seen this movie. It created a sort of unofficial club of a freaks and weirdos who loved movies that weren’t always the most professionally produced, but still provided a lot of fun for the viewer. I am thankful I was able to experience and learn so much from those early internet horror fanboys. I was introduced to so many different franchises that I didn’t even know existed. Thanks to them I was able to keep a running list of movies to look out for, and that helped guide me from wasting my time (and money) on movies that looked like they were shot with a home camcorder. Not everything was all peachy with these horror fans. They liked what they liked, and because of this they existed in this bubble where nothing else was deemed good horror unless it adhered to the communities standards. I witness the thrashing of lots of horror films that I enjoyed in the 90’s, and that tradition carries on today. Horror in the 1990s is widely considered as some of the worst horror and people love to take jabs at it. In some cases it’s rightfully so. Not a lot of tent pole franchises were established in the 90’s, and instead we suffered through sequels of once great franchises that were usually reduced to straight to video. But was it all really that bad? I don’t think so. In fact, I loved a lot of what I saw in the 90’s, and because I was born in the early 80’s, these were the movies that I grew up with. I guess you could call me a 90’s horror apologist. I’ve decided to take my love and appreciation of 90’s horror to a whole new level. I want to feature review and discuss various films and franchises that occurred between 1990 and 2002. Why 2002? Well, in my eyes the 90’s didn’t really die off till 9/11 and several movies filmed pre-9/11 came out in 2002. I’ll be paying special attention to the post Scream films (1996-2003). I was in middle school and high school through these years and to be honest, I missed a lot of them. I was so preoccupied with 80’s horror that I despised anything new that was coming out (thanks internet horror community!). It was only years later that I realized how much nostalgia these films held with their settings, soundtracks, and cast. These were my generations horror films whether we liked it or not, and while we didn’t get Freddy, Jason, and Michael Myers we did get Ghostface, Death itself in Final Destination, and The Blair Witch Project. So, welcome to The 90's Horror Review, where I attempt to keep the decade highly regarded as the worst in horror still alive.